The weather is warming up so it’s time to protect your pets from pesky fleas, ticks and mosquitoes. To really get rid of fleas, you have to disrupt their life cycle. Fleas thrive in moist, humid environments — that’s why they’re a much bigger problem in the summer than in winter. An adult flea can live for four months on the body of a dog, but it’ll die in a couple of days without its canine host. After a nice meal of blood, fleas mate on the dog’s skin. The female can produce as many as 2,000 eggs during her short lifespan. Those eggs fall off and hatch all over the house — in the carpet, on the couch, under the covers, in your yard. Eventually those newly hatched fleas will need to find a host of their own, and the whole cycle starts all over again. So it’s not enough to kill the adult fleas; you have to get rid of all the eggs and larvae, too. 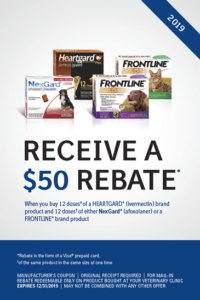 Heartworms in dogs are easy to prevent, but difficult and costly to cure. Only by the bite of an infected mosquito can a dog contract heartworms. 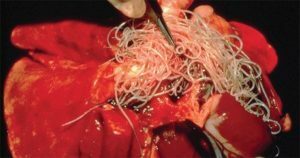 It takes about 7 months, once a dog is bitten by an infected mosquito, for the larvae to mature into adult heartworms. They then lodge in the heart, lungs and surrounding blood vessels and being reproducing. Adult worms can grow up to 12 inches in length, can live 5-7 years, and a dog can have as many as 250 worms in its system. 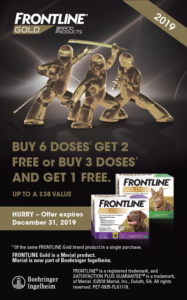 We carry Frontline Gold- This is a topical that has a triple action formula. Fipronil, (S)-methoprene and Pyriproxyfen that make it relentless at killing fleas, flea eggs and larva, as well as ticks. This is a one month application. We carry Sentinel- Sentinel is a flavor tab given once a month that protects your pet from: fleas, heartworms, roundworms, hookworms and whipworms. This product prevents flea eggs from hatching but does not treat adult fleas. We carry Bravecto- Bravecto is flea and tick control for 12 weeks in one convenient chew. We carry Revolution and Revolution Plus- This is a monthly, topical application that protects against fleas, ticks, ear mites, roundworms, hookworms and heartworms. 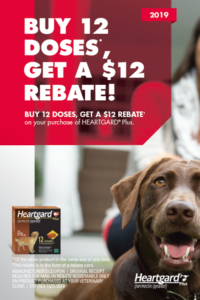 We carry Nexgard- Nexgard is for use in dogs only and is approved for puppies 8 weeks of age. . 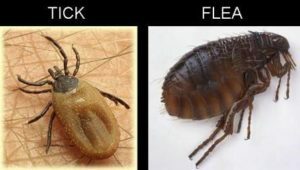 It kills fleas fast before they can lay eggs and kills fleas/ticks all month long. There are many different remedies and methods for treating fleas, ticks and heartworm. To ensure that your pet is protected against these pesky parasites, schedule an appointment with us as soon as possible. Our veterinarians and support staff have extensive experience in both prevention and treatment, and we are here to help.